Dale Stephens, professor of chemistry emeritus, began teaching at Bethel in the fall of 1968. "Having recently come from graduate school and the science industry, I was shocked at the very limited facilities available to students," says Dale. "My wife and I felt that if we could get to a place where we could help support the department, it would be a blessing." 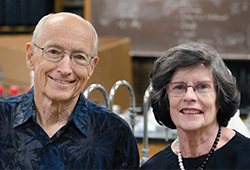 Upon his retirement in 2007, Stephens and his wife, Sharon, donated a $100,000 matching gift to fund a summer student-faculty research endowment for chemistry and biochemistry students. "Summer research had not been available to Bethel's science students," says Dale. "Sharon and I have been blessed in ways we never anticipated, and we were able to meet a need that I saw as a faculty member." Their investment has borne much fruit. High school graduates who excel in science are often drawn to Bethel because of its unique undergraduate research opportunities with highly credentialed faculty. Many science majors have received national recognition for their research achievements, and exceptional faculty/student research projects have helped students receive competitive graduate school placements and fellowships. Last summer, 45 undergraduate science students participated in faculty/student research projects, a remarkable number for a university of Bethel's size. The Stephen's legacy of giving continues today through a charitable IRA Rollover, an option that allows donors to support Bethel while meeting their financial goals. "We never thought we would have money to do anything like this," says Stephens. "We thought it was for other people and big donors. But giving has always been a big priority. For us, the rollover of our minimum distribution made sense." And it made an impact. "I have often wondered why Bethel came to have such an outstanding science division," says Rollin King, professor of chemistry and department chair. "I've concluded that it's the vision and dedication of a few key people, with Dale being foremost among them." Learn more about how a IRA Charitable Rollover can advance Bethel's mission .